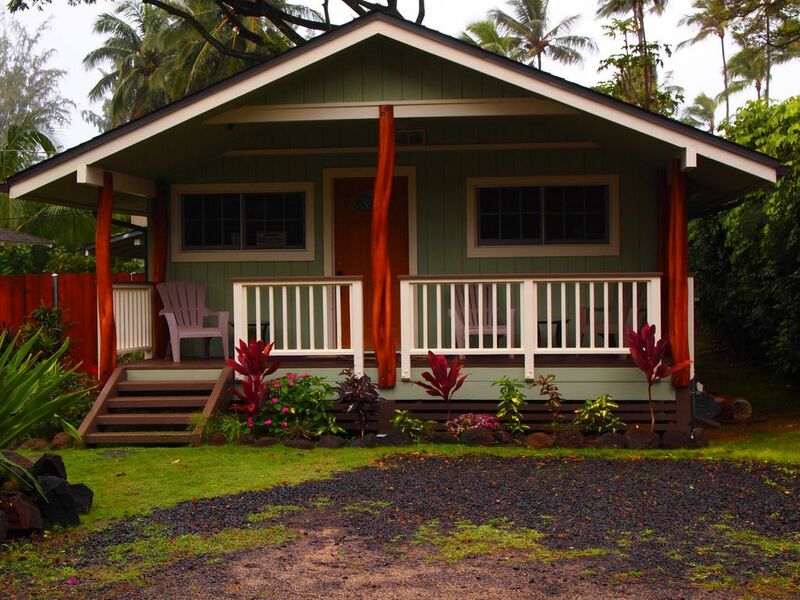 This Ke Iki Cottage is all renovated with a granite kitchen counter top, and a clean bathroom w/ tub & shower also an enclosed outdoor hot water shower. The interior and exterior all nice clean and fresh. We did the remodel the whole time keeping in mind the almost forgotten Hawaiian Style home that dates back to the classic north shore days. Ke Iki Beach is known for its quiet pristine white sand beaches. If you are looking for a place to be loud and party this is not the place for you. The North Shore is known for its lush tropical plants along with a beautiful country setting. This cottage is located right on the four-mile bike path for morning strolls or afternoon walks in paradise.Four bikes are provided for you and your family to enjoy. We are walking distance to Foodland and The Coffee Bean also Sharks Cove lunch truck garden for everyone's taste and rental equipment. The Kottage is just minutes from the Turtle Bay Resort - Known for its championship golf course, Lei Lei's Restaurant, Roy's beach side dining,Tennis Courts, trail riding and shopping or just relaxing at the poolside bar with a mai tai. Please feel free to contact us with any questions. Please email to check availability. There is a 4 night minimum unless last minute or special requests. Aloha! Ke Iki Beach is located out the back gate up a walking path past 4 houses. No streets to cross! Has it ALL and more! Very much enjoyed our stay! Myself and 4 daughters had plenty of room. The house has all you need to have an amazing trip. A easy walk to the beach, fun short bike rides to sharks cove, north’s shore store, foodland and more! Owners are fantastic and easy to work with... don’t look anywhere else for your next North Shore getaway! Amazing. Couple small glitches corrected instantly by the very very pleasant owners. We are definitely bookmarking this property and returning some day soon. We absolutely loved our stay at the cottage!! It has everything you could ask for, very well outfitted from bikes to snorkeling equipment and beach chairs and toys. The location is absolutely perfect as everything is within walking distance. Already tried to book this property again, but was already booked. Thank you Donna and Darryl, we could not have asked for a better property!! My family of 4 (2 teens, 1 boy 1 girl) stayed here for just shy of a week. The kottage is exactly as described so, no surprises. This home and it's grounds are well maintained. I read the reviews and some people were having difficulty locating the beach - that was not an issue for us (out the back gate and walk toward the water - beach access is between the fences) however, the small climb down could "trip" some people up. Just be careful! My family took advantage of the bikes and rode everywhere; Waimea Bay, Sharks Cove, Food Land, beaches north... having the bikes was the best!! Donna and Daryl start you out with the essentials so this is an added bonus. Thank you so much and if we return to Oahu we would definitely without a doubt stay here again. Mahalo. Amazing location, clean & cozy house--can't wait to go back! We had an absolutely wonderful time staying here. The house was well stocked with everything we needed, including all kinds of toys and amenities for our 2-yr old. Donna and Darryl were extremely kind and helpful hosts. The house is literally steps from the beach--crashing waves rocked us to sleep every night. The backyard was big and beautiful, perfect for lazy lounging, and the lanai was excellent for people-watching. Our son loved chasing the lizards! There are dozens of different food trucks just around the corner catering to all tastes and diets. There was so much to do, we wish we could have stayed longer than a week! Ke Iki Kottage is just minutes from the Turtle Bay Resort - Known for its championship golf course, Lei Lei's & Roy's on the beach restaurants, Tennis Courts, and shopping or just relaxing at the poolside bar with a mai tai. For the islands best diving & snorkeling just walk down the bike path to Sharks Cove. Sharks Cove also offers a food truck garden to please all pallets. Please feel free to contact us with any questions or concerns. Aloha!